Over the last 18 months, I have tried a number of different super lines in the surf. The main reason for my testing these is their low stretch and fine diameter. It allows you to cast further without having to use a shock leader. I’ve been using genie link clips tied directly to the braid and attaching my rigs via these handy wee gems. Let’s take a look at Sufix Performance Braid. I started with Berkley Fireline in 50 lb. This is technically speaking a fused line and not a true braid. Fireline is a fantastic product for soft baiting, spinning, and other applications where abrasion is not an issue. It is widely touted as being the best option for spinning reels. Unfortunately, heavy surf and river stones left it frayed, stripped of its coating and generally looking a bit sad. It did increase my casting distance but wasn’t ideal. Although it performs well on flat sandy beaches, I fish mostly steeply shelving shingle beaches and was having to regularly cut-off at least a metre of line to avoid bust offs. My next purchase after a bit of research on the internet was a spool of PowerPro in 50 lb. PowerPro is a braided line available via several New Zealand suppliers (notably discount fishing supplies and Decoro). It’s a good product with a diameter that is equivalent to just 6 kg mono. It has very good abrasion resistance, is reasonably priced, and is available in spools up to 1300yds. The only drawback is that it is kind of noisy through the guides. Again in rough seas on shelving beaches, it gets damaged and needs to be cut back and fades very quickly from the original colour. However, I’ve never lost a fish due to mainline failure. I would recommend it to anyone wanting to try braid in the surf. Recently Sufix has released a new braid product; Sufix Performance Braid. I’ve been using various Sufix trace materials for about 4 years and have found them to be excellent. These are becoming more readily available and most good tackle stores now stock them. 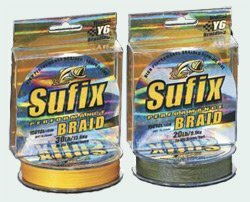 Sufix Performance Braid is braided using a new proprietary construction method known as Y6. This is a digitally controlled process weaving strands of Dyneema to produce a compact fine and round braided line. It is quieter through the guides than PowerPro (though still noisier than mono). It lays down on the spool well, and unlike the other two brands mentioned, an afternoon’s fishing in the heavy surf (2-3m swells on a shelving beach) and the line came back looking like it did when I first spooled up! Subsequent trips, and a few decent fish, and it looks a little bit paler but the coating doesn’t rub off and there is no evidence of fraying. It definitely lives up to its abrasion resistance claims. As with all super lines, the bite sensitivity is phenomenal. You can see exactly what is going on with your bait. The low stretch makes it possible to set a hook with the smallest of movements. I would recommend it above all other braids I’ve tried so far in the surf. It is a fantastic product and whilst a little more expensive than the other two brands it is thinner than both of them. It is quieter than PowerPro and casts like a dream. Next time I spool up however I may try it with 20 lb Sufix Performance Braid as the mainline and a 50 lb braid shock leader. Performance braid is available in 150 and 300-yard spools from most good tackle stores and comes in yellow or green. Give it a go and I think you may be pleasantly surprised. Select quality reels with metal spools and quality line rollers. Remember to set your drags for the rod weight you are using. Never tie hooks/sinkers etc to the braid. The best system I have found so far is to tie the braid to a genie link clip and attach the rigs to these with a swivel. If you get snagged apply pressure to the line only by wrapping it around a stick or other similar object and pulling against it. Never attempt to pull it free using leverage on the rod or by wrapping it around your hand. Braided lines from Sufix.